Terra Cresta is a vertically-scrolling shoot-em-up set over a constantly scrolling landscape of islands and enemy installations. 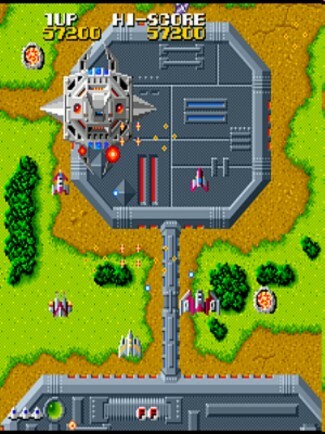 The player is under constant attack from enemy spaceship waves, ground-based guns and turrets, dinosaurs and three different mothercraft ships. The levels are littered with ground-based silos bearing numbers between 2 and 5. These can be shot to release a player ship component, which then attaches to the player’s current ship, increasing both its size and firepower. Power-ups available are 2-Wide shot, 3-Rear Shot, 4-Front cannon and 5-Rear shield. Using the ‘Formation’ button splits the ship parts into a formation for limited time, giving increased fire power. The number of parts acquired determines the formation. For example, if the player has picked up two ship parts then a triangle is formed, with the player’s main ship at the rear of the formation, with additional two ship components positioned at the front edge of the triangle. When all four numbered parts have been collected, the player’s ship transforms into a flaming Phoenix, and is indestructible for a limited time.